The Dance Festival You’ve Been Waiting For! Home / Misty Minute / The Dance Festival You’ve Been Waiting For! This summer I will begin my 20th year in studio ownership. Over the past two decades I’ve seen a lot of trends in our industry – some great and some not-so-great. On the up-side I’ve seen the popularity of dance shows and competitions drive more involvement in dance studios than ever than before. And opportunities for students to learn outside the studio are at an all time HIGH. In most major cities, most weekends of the year, students can find opportunities to participate in conventions, competitions and master classes. Three cheers for opportunities to grow! However, the same popularity that has created increased traffic to our dance studios has also created a growing number of less-than-ideal, and sometimes even unacceptable, convention and competition environments for our kids. Does this sound familiar? Missing school for competitions that start on Thursday nights, dancing from 7am until 11pm awards only to start again the next day at 7am, and seeing kids disappointed with High Gold awards, even if it’s what their performance truly earned. I’ve been there. I am want to do my part. 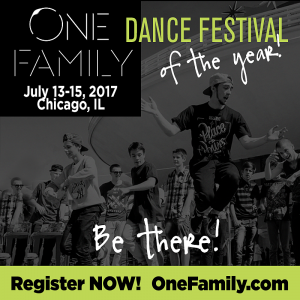 To that end, I am excited to announce that we have partnered with Untapped Movement to create a the One Family Festival, July 13-15 in Chicago,l to provide happy, healthy and safe experiences in dance. Have you been looking for an event with excellent dance classes that creates a space for dancers to connect while sharing their stories in an uplifting and supportive environment? One Family Festival is exactly that. The One Family Festival will be a place for everyone to come no matter their skill, age, or background to connect with a community of others who share the same passion and love for dance. We believe that everyone has something to say whether it is through words or movement and what better place to have your story heard than at the One Family Festival surrounded by those who share similar experiences. Our goal is for you to leave proud of all you have accomplished through the master classes and workshops, experience a deeper connection with the dance community, and most importantly, feel inspired by the unique stories shared throughout the event. This festival is designed to be a place to train, recharge, connect, grow, learn, hope, and dream. Whether you’re an individual dancer from east Tennessee or a competition studio from Sydney, Australia, there is a place for you here. More Than Dancers and Untapped are organizations partnering together in the One Family Festival. More Than Dancers is an online magazine created for dancers to access tips and advice to promote balanced living, to be encouraged, and inspired. Untapped Movement is a popular online community rapidly connecting dancers and studios around the world. Together, they share the same vision and to connect everyone together through the art and beauty of dance. At One Family Festival, students will experience an array of master classes and workshops to help grow in their craft while connecting with those around them. Not only will dancers learn from the top teachers in the industry but they will make friends with them as well. Dancers will be able to showcase a specific routine, costume, and music that best represents their story then share it with the audience. A cinema room will be provided the opportunity to have their performance captured on a real film set with a set of Hollywood-quality lighting and cameras. They will also get to watch an exclusive screening of the newest One Family film. If you are looking for something a little different (well, A LOT different) and you want to place to be a part of something greater, then we want you to come to the One Family Festiva!. Please consider joining us in Chicago, July 13-15, 2017, it will be unlike anything you’ve ever seen before. Check out onefamily2017.com for more event info!